Friday, January 19th @ 7:00PM – Only $26.95 per seat! Bee Gees Gold Tribute Bio John Acosta as Barry Gibb has performed in Bee Gees Tributes all over the world. His portrayal of lead singer Barry Gibb is with a zest for detail, like no other. From the look to the falsetto you will close your eyes and say it’s Barry! John Acosta’s Bee Gees Gold tribute Is the ultimate salute, and experience of seeing the Bee Gees in their prime, LIVE ONCE AGAIN! The frontline consists of the detailed vocal stylings of John Acosta (Barry), Daryl Borges (Robin), and Jeff Celentano (Maurice). There is a sensation that will make you blurt out: Wow… I just seen and heard the Bee Gees! 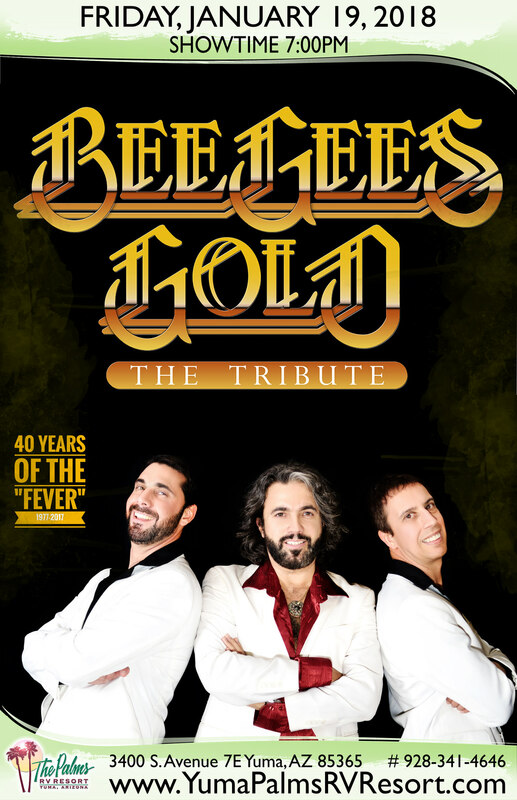 Backed by a live band, the Bee Gees Gold tribute recreates the look and sound of the Bee Gees from the 60`s to the late 70`s, with their unique falsettos that made them legends. Performing such early hits as Massachusetts, I started a Joke, to the later Disco classics, Stayin’ Alive and more.